If you want a really terrific turkey this year, try brining the bird. You do have to start a little earlier, but it's worth the extra effort. Here's my basic Brined Turkey directions and basic recipe plus some ideas, so that you can doctor up your own turkey and have a unique flavor this year. Once you brine your turkey, then you smoke it like you would other meats. But, don't add the water to the smoker. You want a higher temperature, similar to oven cooking. Aim for around 350 degrees F and about the same cooking time as in the oven. 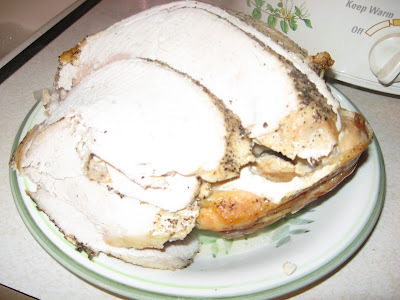 The reason for the quicker cooking for a smoked turkey is that turkey meat dries out if cooked really low and slow. The texture is simply different from beef or pork. It still takes a while to cook a turkey on a smoker or on a grill with a lid and on the cool side of the grill (not directly over the flames or heat). The smoke flavor gets in there fine with the shorter cooking time. If you don't want a whole turkey, you can do a bone in turkey breast. Just make less brine if doing a breast or breasts. Cooking time is less as well, since the size is not as large. Also note that you want to go with the basic water brine recipe in the guide rather than the fruit juices, because the skin may get too dark with the extra sugar in the juice. We plan to smoke a turkey breast and a spiral ham for Thanksgiving this week. I think we'll plan to do the smoking on Wednesday, so we're not trying to cook both indoors and outdoors on Thanksgiving day. Turkey is fine served cold but can also be heated up for the meal. The smoked flavor is actually more obvious the second day.